“Forbidden” and “Impossible” are the two words that have perhaps been the cause of most adventure, exploration and discovery. Such is the nature of the human mind. Loving the drive on the winding road ahead of Bhaironghati, on my maiden venture to Gangotri, in the summer of 2000, one of those words had caught my attention. "नेलोंग , प्रतिबंधित क्षेत्र में जाना वर्जित है"
That left a mark in the mind though we neither had the time nor the inclination to dwell upon it further on that occasion. 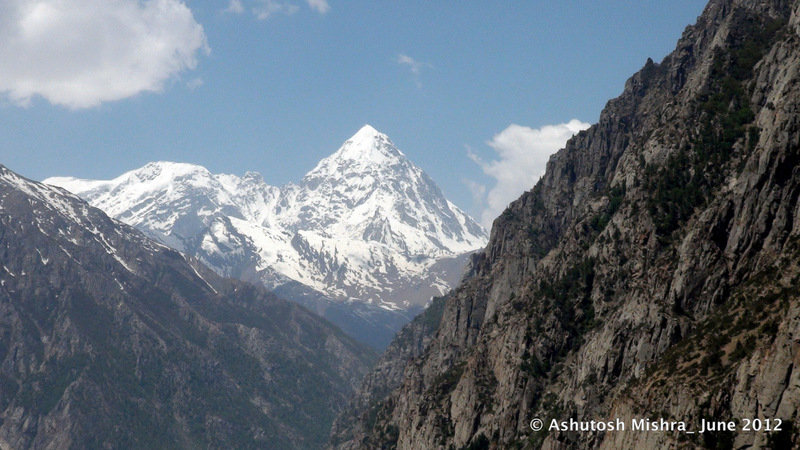 For a new visitor, the Bhagirathi valley has enough on offer to keep one’s eyes, mind and camera busy. The words kept coming back much after we were back home. “The place has history!” I realized, when I researched the Nelang area. Giving rise to one of the largest tributaries of the Bhagirathi, the Nelang area lies to the North of the Bhagirathi Valley. 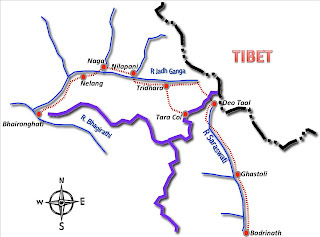 It forms a buffer between the China-controlled Tibet and the valley that gives rise to the holiest river of India. 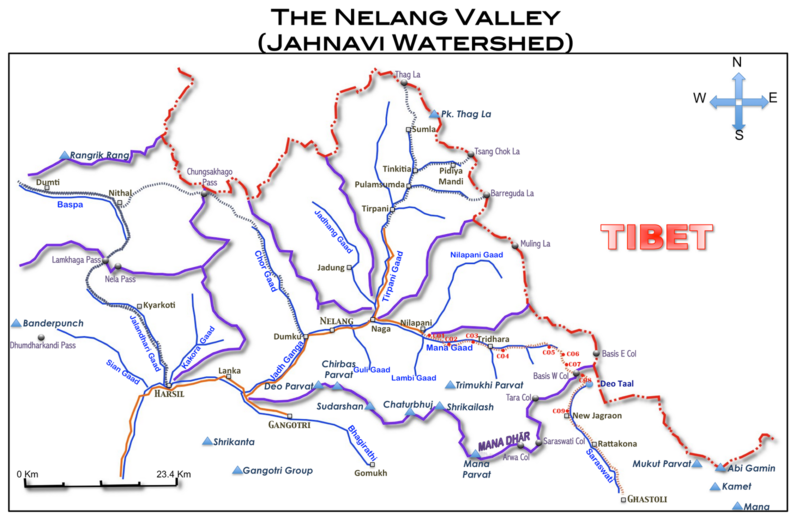 The tributary that comes in from this watershed actually bears a name, that’s a Vedic Synonym of The Ganges, The Jahnavi or The Jadh Ganga. The story of the Holy Ganga's descent from the heavens describes, the tribulations that the Great King Bhagiratha went through. 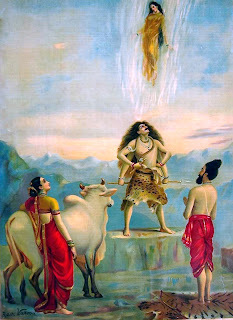 Many of us may think that the story ended when Lord Shiva opened his matted locks and the mighty Ganga landed on earth at the Gaumukh Glacier. But the puranic story does not stop there. Apparently, King Bhagiratha still had a job to do; he had to lead the river-mother to the area that were to later become ocean. As he did so, he came upon the hermitage of the great sage Jahnu. The tempestuous flow of the river inundated and damaged the sage’s hermitage inviting the wrath of the learned one. In a feat of anger, the sage swallowed the entire river in a single gulp. King Bhagiratha was crestfallen with his luck, yet again, and started praying to the Great Sage to release the river-mother. Pleased with the King’s humility and devotion, the sage released the river from his body. Since she emanated from his body, she became, theoretically, the daughter of Sage Jahnu. Thus she got an additional name- Jahnavi; The daughter of Jahnu. The river in the Nelang Valley watershed carries this ancient name. If ever one visits this area one can realize that there may be some geographical credence to this age-old story. The deep gorges that define the Bhagirathi for the entire length of 20 Kms from Harsil till Bhairon Ghati do indicate that there would have been a time when tremendous force of water would have cut through those walls of rock. It may be that, the river was stopped or dammed due to natural causes at some ancient time, which would have caused water to accumulate and then burst forth with great fury cutting away all those gorges! Who knows? “1962 के बाद यह एरिया बंद हो गया सर। यहाँ अन्दर "जादुंग" गाँव था। उस गाँव के लोग अब हरसिल के पास बसते हैं। अन्दर खाली मिलिटरी वाले जाते हैं। ”. I remember listening to Chandan Singh Bisht’s narrative almost a decade back. The place came knocking back at the consciousness on many occasions thereafter. Reading up Heinrich Harrer in his book “7 Years in Tibet” (The Character played by Brad Pitt in the Hollywood movie titled by the same name) I realized it’s that forbidding valley through which Harrer escaped to Tibet from the British prison at Dehradun. 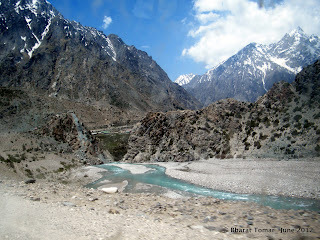 J B Auden in his famous exploration of the tributaries of Bhagirathi landed up in this valley in 1939. He wished to cross over from the Nelang area to the Alakananda watershed but did not succeed. He returned to the Bhagirathi and explored the left bank crossing over an unnamed col into the Khatling Glacier and Kedarnath area. That col still bears his name (Auden’s Col) but the extraordinary explorations he did a couple of month’s before that remained relatively unnoticed. Mr Harish Kapadia and Mr Romesh Bhattacharjee from the Himalayan Club repeated Auden’s explorations in the late eighties and documented their experiences with great detail. In fact it was one of those late evening browse-throughs of Mr Kapadia’s writing that I saw the first glimmer of possibility to explore this forbidden area. The experience of struggling through the bureaucracy to enter the Girthi Valley in the previous year added to that budding confidence. 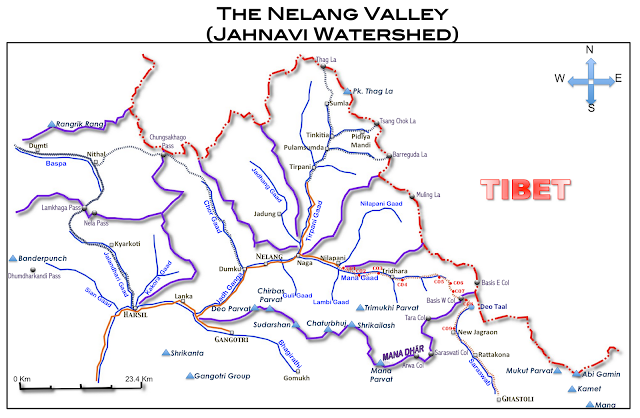 The Nelang Watershed was famous for many centuries for the massive trade traffic between South Western Tibet, Garhwal and Rampur-Bushaher. 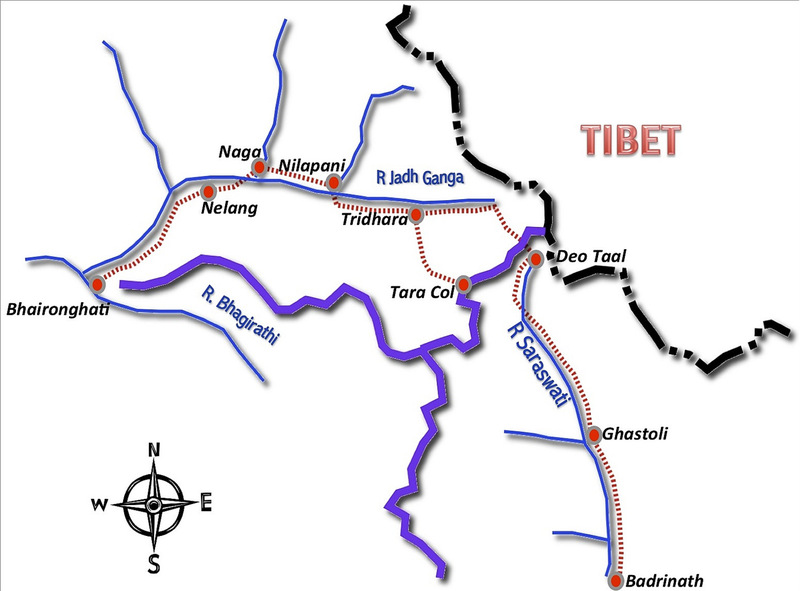 With Tibet to its North, Rampur to its West and Garhwal to its Southwest, it was the Himalayan Singapore in those days. The wide trans Himalayan watershed had few villages- Nelang and Jadung; and one market- “The Pidiya Mandi” (Mendi- as mentioned in old British Maps), which used to attract traders from far and wide. Old inhabitants of Uttarkashi still remember the weird habits and looks of the Tibetian traders that came in to trade from the Nelang area. Ridges that have an average altitude of about 6000 Meters bind the entire Nelang Valley. To the North is the Thag La ridge, to the West are the high ridges of Garhwal Himalayas, to the East is the Muling Ridge and to the South and South-East is the Mana Dhar Ridge. Three major streams come together to form the Jahnavi or the Jadh Ganga river in the Nelang or Jadh area. The one on the Western extreme is called Chor Gaad, The one in the middle is called Tirpani Gaad and the one to the South-east (bordering the Alaknanda Valley) is called the Mana Gaad. Each one of these streams has a bit of history behind. The Tirpani Gaad valley saw most of the trading activities for eons. 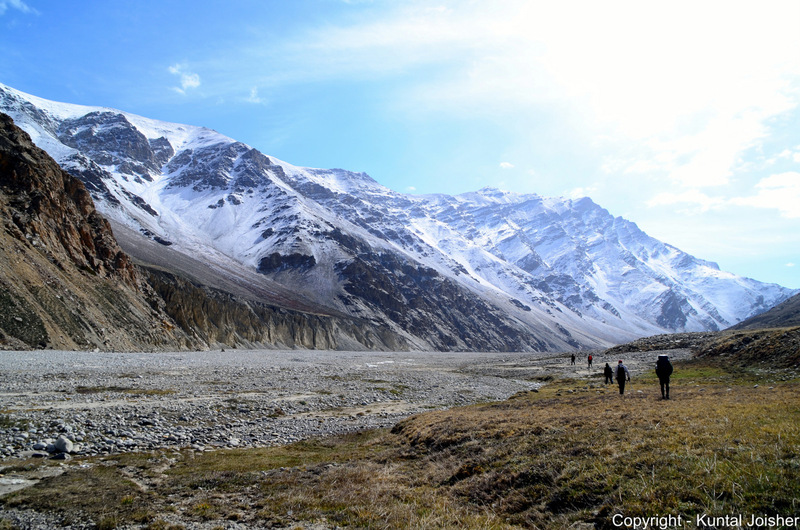 The two passes at the head of this valley- The Tsang-chok-La and The Thag-La were the favorite routes of many Tibetian traders because of the easy passage they offered. 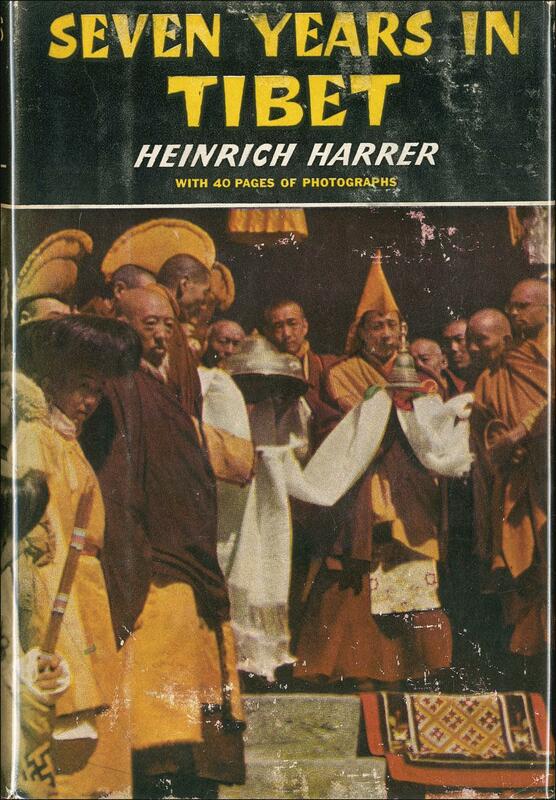 In fact, Harrer in his famous escape to Tibet used the Tsang- Chok-La. Thag La, the other pass also used to see much traffic of Tibetian Traders headed towards Pidiya Mandi in Nelang. The Chor Gaad valley helped the not-so-scrupulous traders to carry out tax evasion (and hence the name). In fact tax was the bane of the inhabitants and traders of Nelang. All the three political entities surrounding it claimed taxation rights- The nearest Tibetian Djong-Pen, The Raja of Rampur-Bushaher and the Raja of Garhwal. The Chor Gaad valley was used by the traders to escape the Tax collectors and establish an alternate route between the Nelang Trading Zone and the kingdom of Rampur-Bushaher over a lesser-known pass called Chungsakhago La (An Account of Kunawoor in Himalaya- Capt Alexander Gerard – PP 17/48/49, 1840- James Madden & Co) at the head of the Chor Gaad valley. Crossing the Chungsa-khago, brought one to the Baspa Valley and then on to Chitkul, Sangla and Rampur. The Mana Gaad valley saw relatively less action except for a trading pass called Muling La which lies at the head of on of its tributaries- The Nilapani Gaad. Auden in his 1939 exploration reported that this pass had been in disuse for close to a hundred years at that time. 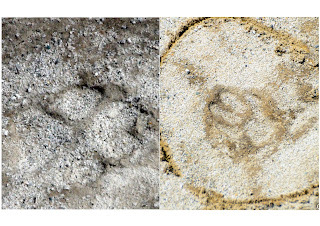 This means, it has been in disuse for close to at least two centuries as I write this in 2012. Perhaps comparatively more action has been seen in this valley in the last 50 years, after establishment of permanent posts by the Indian Army and the ITBP after the 1962 Chinese Aggression. The interest in the area re-kindled after finishing the Girthi Ganga exploration in 2011. Browsing through Google Earth and the threads of indiamike.com in one of those lazy evenings I chanced upon 2 things. A series of pictures posted in the Nelang region by R Bhattacharjee (which he had shot during his explorations in 1985) and an announcement by a team from Bangalore to cross the Arwa Col from Alaknanda valley into the Nelang Valley. Arwa Col was first christened and referred to by J B Auden (Younger brother of famous poet W H Auden) during his 1939 explorations (Himalayan Journal Vol 12, A Season's Work in Central Himalaya), which he wished to locate and cross for finding an easy passage to the Alaknanda valley and Arwa glacier. He did not succeed in locating it. 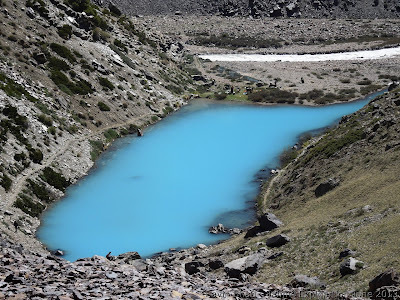 Mr Harish Kapadia from Himalayan Club Mumbai followed Auden’s route almost 50 years later and landed up at an alternate pass – Saraswati Col, which allowed a look into the Alaknanda watershed. The team from Bangalore led by JP Gupta was planning to do what had not been done yet. 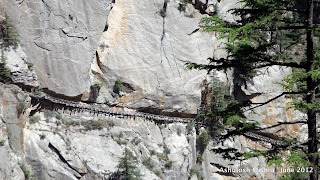 They were not only planning to locate the Arwa Col, but also intended to use it for crossing over from the Alaknanda watershed to the Nelang valley. If they managed to do it, they would be the first ever in the history to do so as a civilian expedition team. Out of sheer curiosity, I started doing a Google Earth research of the possible route they could follow and soon got hooked on to doing a virtual exploration of the valley for almost the entire month of the August of 2011. Armed with the digital elevation data and the satellite imagery of the area taken at different times of the year, so easily available with Google Earth, I managed to plot routes in the entire Nelang valley and also chanced upon three different points on the Mana Dhar which seemed like possible non-technical cross-over points from the Nelang Valley into the Saraswati Valley in the Alakananda watershed. 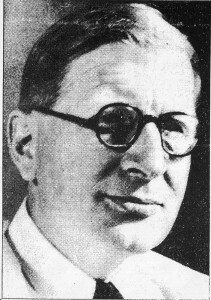 After that month-long research I was reasonably confident that an easy crossover was possible and we did stand a chance of being at least the second team in history to achieve the objective, the idea of which, was created by Sir J B Auden about 75 years back. It all depended on the success of JP’s team from Bangalore- whether we would have a chance to be the first team or the second. Three month later, a phone call from Vishwa, my trek-mate in the Guptakhal trek, who was also part of JP’s Arwa Col team, gave me a glimmer of hope that we might have a chance of attempting to make a first-ever crossover from Nelang to Alaknanda watershed. The Bangalore team’s attempt was hurt by unfriendly weather – The Mana Dhar remained unconquered by civilians. The trekking season for 2011 was ending soon and God willing we had a chance of an attempt in the early summers of 2012. Thus the idea of “Auden’s Trail- 2012” was born. In a way we wished to commemorate Auden’s idea after 75 Years. We wished to crossover from the Mana Gaad valley in the Nelang(Jahnavi) watershed into the Saraswati Valley in the Alaknanda Watershed over the 6000 Meter high Mana Dhar . 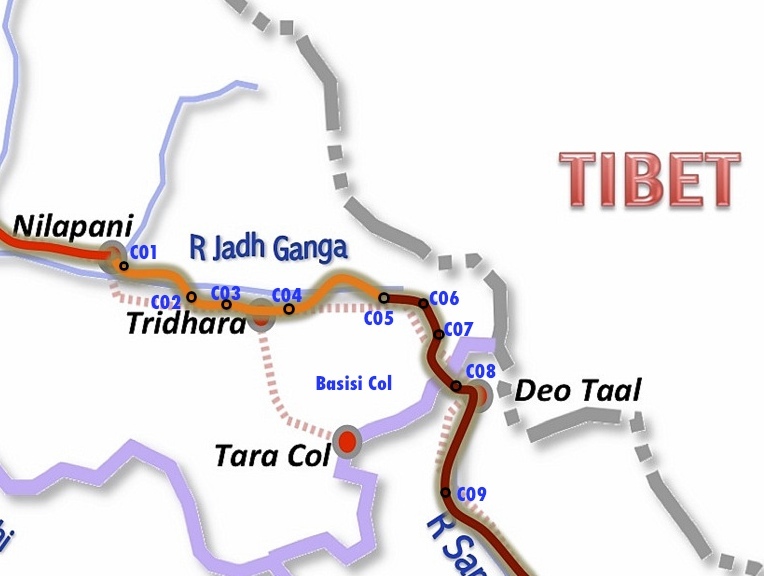 We would thereby also open a new route between Gangotri area and Badrinath area; possibly an alternative to the deadly “Kalindi Khal”. 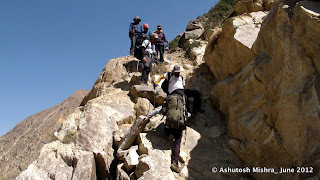 A strong and proven team was needed for the exploratory expedition and hence we could not afford too many new members. With stringent evaluation, we did manage to include a few good campaigners in the team who also later, as usual, became friends for life. 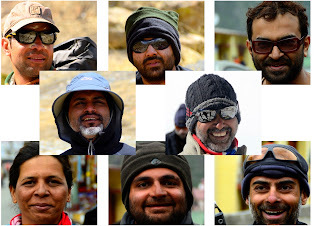 Bharat, Rajesh, Ravin, Kalyani had all been in difficult treks together and were seasoned campaigners. Bunty was trekking for the first time after a gap of 10 years, but being my first cousin and childhood-buddy I was aware of his physical resilience. But, Kuntal and Anant, the new members were the real discoveries. I wasn’t really too worried about their physical abilities, given their past experiences, but about the aspect of the teaming in together. Both surprised us all by their positive contribution and engaging spirit for achieving the mission objectives. Kuntal was on a sabbatical from his high adrenalin job in InfoTech and Anant, the young entrepreneur and a die-hard “Crossfit” fan was de-stressing himself briefly from his business. They were interesting, funny and inspiring in their inimitable ways. Almost all the members had a minimum altitude experience of above 5500 Meters in high Himalayas, except for Bunty. He was going to change that status very soon. The Monal guesthouse made the halt at Uttarkashi taste slightly different. Perched high on the sides of the Varanavat mountain, the tall forested hill that overlooks Uttarkashi, the guesthouse has an homely and idyllic setting. The walk back and forth from that high point to the downtown area, prepped us for the trying physical exertion ahead. After finishing the required documentation for insurance and application for ILP (Inner Line Permit) we went over to Matali, about 8 Kms away, to meet the Commandant of ITBP 12th Battalion. We had to handover a letter to him from Capt M S Kohli who had been kind enough to send in his words of recommendation. Commandant Upadhyay was highly supportive of our venture but did re-iterate the necessity to follow the official procedure. The authority to grant permission was the office of the SDM. “Once you get your ILP (Inner Line Permit) from the authorities, we will help and support you in whichever way we can” assured Commandant Upadhyay. We later discovered that not only was the ITBP intimated, but the Army personnel in Garhwal Scouts were also informed about our tour. Perhaps, a letter to the Brigade Command of Ibex brigade had helped. The Ibex brigade, an independent combat formation of the Indian Armed forces, looks after most of the International Border areas in Uttarakhand. After such interactions, the excitement and patriotic fervor in the team raises several notches. An invisible camaraderie develops with all those men in uniform who explore and live in the mountains as part of their job. We rode an open Tata-Ace back to the Uttarkashi town, our hearts throbbing with excitement as to what was about to unfold the next few days. We were going to see the Chinese border :-)! Perhaps rub shoulders with these brave young men in uniform; give them company for a few days and live few moments of pride! “हम तो चाहते हैं की आप जैसे लोग आयें। हमारे जवानों को भी पत्थर और भरल के अलावा कुछ और भी दिख जाया करेगा। …”Commandant Upadhyay was commenting few moments back. ILP was issued the next day and we left for Harsil by afternoon. 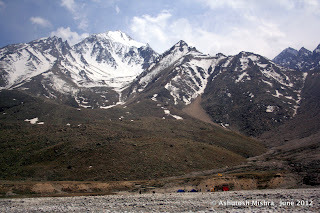 The rains had unleashed fury upon the winding switchbacks of the Sukhi Top, about 10 Kms short of Harsil. Bharat, Anant and I had to get involved in traffic management for a while using our team radio sets. After 4 hours of hold up in the Sukhi Top area we finally managed to reach Dharali late in the night. 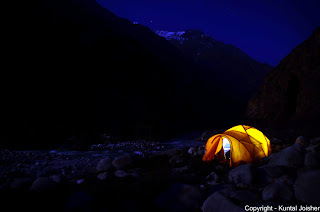 The lazy stay at Uttarkashi had helped in the teaming process. The frequent laughter, teasing and story telling were reassuring. The team was bonding well. Driving by the Bhagirathi on the gently serpentine roads of the Harsil valley is always a pleasure- it’s almost a movie like experience. Before long we were entering the giant bends that leads one to the little Dhaba junction of Bhairon Ghati. There is an ancient Bhairon Temple there. I paid obeisance at the temple praying for the health and well being of my father. This expedition was a personal pilgrimage for me; a prayer to the mountain gods for the safe release of my father. The team had a nice breakfast of Paranthas and watermelon! Kuntal and I warmed up our cameras. We were soon going to enter the road to Nelang- The forbidden road! We shall soon be capturing views that are not easily viewable to the ordinary “Civilian!” :-). Vinod had already left with an advance team in the morning to submit documents at ITBP-Kopang and to acquire the necessary permits from the forest office at Gangotri. We were to rendezvous with them directly at Nelang. The entrance beyond that board is lined with small huts that house the families of the workmen who work on road construction projects inside the Nelang valley. The Government has invested quite a lot of resources to make the Nelang a “permanent” post- one that is open for all 12 months in a year. Well-engineered all-weather roads have been constructed almost till one of the farthest point in the Nelang valley- till Tirpani! “Valley में घुसते ही हवा Bend आयेगा। वहां थोड़ा रास्ता ख़राब रहता है। Otherwise roads are good. You should not have any problems” – Commandant Upadyay had informed us couple of days back. The Hawa Bend is an area having a thin motor-track built along the vertical face of a rock wall. Several gangs of workers and few heavy machines were busy patching up damaged parts of the road. Mid way through it one can see an interesting looking wooden structure snaking across a sheer vertical rock face on the far bank of the valley. “Pitton से बना रखा है यह ब्रिज सर।! पहले घोड़े जाते थे इस रास्ता से।” Jaisingh was continuing his running commentary. Indeed! Harrer and Auden describe this part of the trail in their respective books and so do Kapadia and Bhattacharjee in their respective journals. That interesting looking wooden structure was an ancient piece of engineering- a bridge made out of logs that are literally nailed into the walls of a sheer rock face! The trade traffic from Tibet used to depend on it! As one looks back along the Jadh Ganga driving into Nelang, the Mt Shrikanta stands tall, guarding the exit of the valley. As one looks ahead, an array of snow ridges define the horizon. Towards the right- eastwards, the Nelang valley opens up. Straight ahead and little to the left is the Chorgad valley. Soon the baby pines start appearing on the road side- result of some afforestation drive perhaps. The dusty road winds ahead to the Nelang Check Post. An ITBP guard examines our papers and waves us in. We were now deep into the military area. The landscape now was a shade trans-Himalayan; shallow and brown rocky mountains with sprinklings of snow and some green dotting at places. 9 Kms ahead of Nelang is the Naga Post where the Tirpani Gaad and Mana Gaad, two of the three great tributaries in the valley, confluence together. Beyond this point our route took a more Easterly course and moved along the right bank of Mana Gaad. During the rest of our stay in the Nelang valley, we shall stay with this East-West orientation. Good for camping! One will have early mornings and early sunlight! It was midday when we reached the Nilapani Post, where the Jeepable track ends. Supplies were unloaded and ferried across the river to a lovely campsite, just at the confluence of the Mana Gaad and the Nilapani Gaad. In the afternoon Vinod and I went into the ITBP camp and introduced ourselves to the local post commander- Inspector Nautiyal. After the papers formalities were over, the inspector was gracious enough to lend our team, ten additional liters of Kerosene. But they would not accept the price of that fuel; just humanitarian assistance, they would say :-). As the evening wore on we had this beautiful view of a moonrise over the eastern skies, of a lovely full moon rising over the companion ridges of the Trimukhi Parvat. A nice campfire capped the evening. We were getting ready for the challenge that was to begin the next morning. We took the crucial decision of following the right bank of the river. Three ITBP Jawans had told us the previous evening that the road along the right bank is ok and would easily take us all the way to Tridhara boulder field. Something wasn’t ok. All the readings that I have ever done on the area, have always mentioned a river crossing at the Nilapani confluence; a crossing over to the left bank. Both Auden and Kapadia have written thus. But here we were, trudging up the right bank where the route was appearing too easy to believe! Almost 200 meters upriver from the campsite, we saw the Lambi Gaad coming in from the opposite bank, from the glaciers that accumulate at the bottom of the North Face of Mt Shrikailash. A log spanned the body of the water indicating a temporary route on the opposite bank- on the true left of Mana Gad as described in many texts. After negotiating a nasty descent on a rock about 150 ft high, we walked long for about 4 Kms after which the trail disappeared. The ITBP personnel who advised us to follow the right bank the previous evening had perhaps not come this far! The only choice we had was to cross the Mana Gaad and hope for a better route on the other bank. The topography on the far side was looking much friendlier. After an eventful crossover we soon found ourselves on a nice campsite above the high left bank of the river. My Google research was correct after all! The satellite imagery and elevation data of Google Earth had shown a much friendlier track on the left bank. I chose to ignore that because I thought the ground intelligence of the local ITBP scout was perhaps more reliable. It is a much better idea to make the crossing at Nilapani itself and catch the left bank. There is a trail and the route is much friendlier. Dead Juniper wood was abundant at the campsite! We lit up a nice campfire on that grassy balcony overlooking the Mana Gaad valley. Somewhere over our heads Mt Shrikailash ruled supreme. I could only imagine. We were so near it, the mighty peak was beyond our line of vision. We had to reach the large boulder visible due southeast and then veer into an easterly course. Vinod had advised accordingly and that broadly agreed with the GPS plot too. I was happy to be back on my pre-plotted GPS navigated route. There were no guides here. We were self-navigating a route dangerously close to the not-so-friendly borders of our neighbor. We had to depend on the 13 satellites of Uncle Sam hovering over our heads for accurate feed back on our geographic location. After an arduous climb that lasted over couple of hours we arrived at a flat terminal moraine field of a glacier long dead. The route ahead for a very long distance looked much friendlier than what we had encountered so far. An hour later we were looking down at a wide-open valley from our high rocky platform. The place wore almost Harsil-isque dimensions. 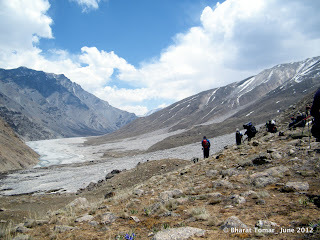 This valley was as wide as the Bhagirathi valley is at Harsil! Surrounded by purple wild flowers, lying on that high rocky platform, that view of the Trimukhi Nala area remains indelible in the mind. To our right, the tall summit of Trimukhi Parvat pierced the skies. Far below, the rocky bed of the Mana Gaad flattened out wide, at the middle of which, a mound of bright yellow caught our attention. 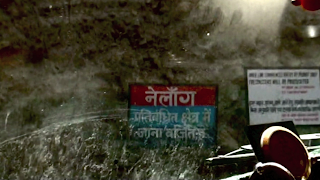 “कोई expedition वाले अपना load dump किये होंगे”, said Jaisingh. An hour later we were examining packets of tasty-sounding Army rations, all of which were beyond their stated expiry dates. That did not deter us from using the camp kitchen to cook up “expired” Halwa and Dal Makhni. However, we could not consume all of that, fearing unnecessary repercussions upon the team health. We decided to camp here an additional day to acclimatize better and manage some load ferries. 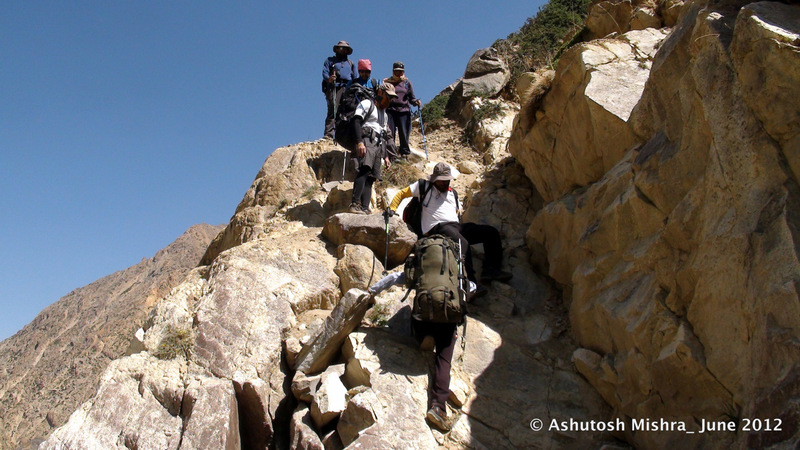 The next day, Vinod and Jaisingh went for a recce ahead with some porters and load. Another team went back to Nilapani for getting the supplies we had left back there. After a long lazy day inside the tents we got chatting with Jaisingh and Vinod who had just come back from the recee. All I gathered after a long discussion was that the route ahead was nice and easy. The walk next day was indeed fun. Rolling Meadows spread out unendingly. The Ghora Dhar on the far bank wore a weird black-and-white look. A thin layer of snow suddenly depresses things around; perhaps because it suppresses all natural colors in the landscape. Soon enough we were in the middle of the colossal boulder-plains of the Tridhara confluence. The Mana Gaad valley led in from the south to our right, the Ghora Gaad valley was straight ahead. This is where we shall deviate from the trails of JB Auden and Harish Kapadia. We shall go deep into the Ghora Gaad valley straight ahead. Auden and Kapadia had gone south to the right from here. The Tridhara area presents another perspective to the Himalayan dimensions. It took the average team member almost an hour to cross the massive field of boulders. the team members looking like tiny dots against a giant canvas all the while. Walking through Tridhara we were desparately looking for tracks of wild animals. Both Auden and Kapadia have written about existence of Leopards and Bears in the area. 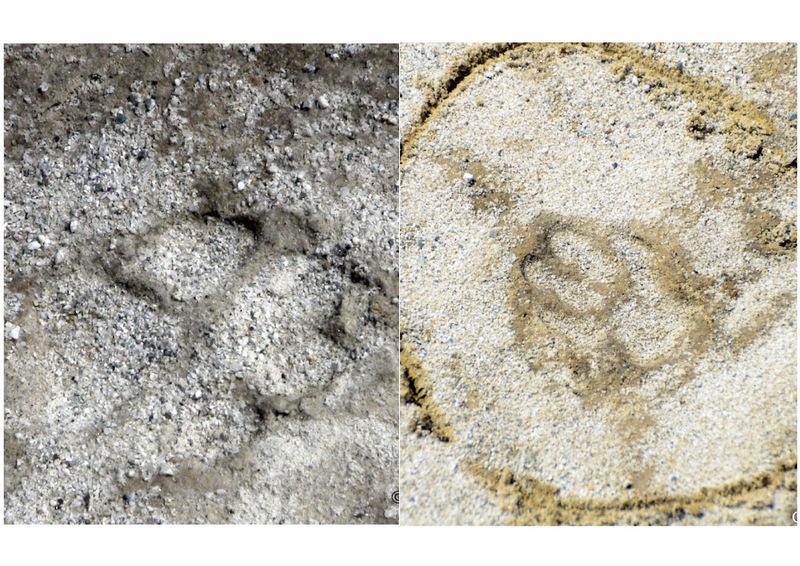 Not long after were lucky to find tracks of at least one leopard and one bear. The desolate terra firma has ensured conservation by its geographical remoteness. The mouth of the Ghora Gaad valley had a nice grassy campsite. Vinod and party had dumped their loads there the previous day, well covered and protected under a tarpaulin. We lost 2 precious hours waiting there to regroup. 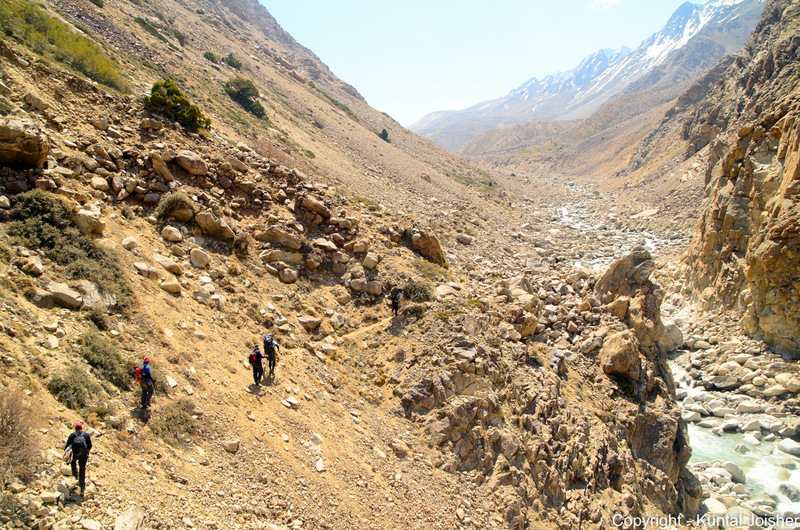 The porters were walking slowly and they weren’t willing to walk much further. It required a bit of cajoling, getting them to catch up fast and proceed beyond Tridhara. 2 Kms deeper into the valley we found a nice campsite with plenty of firewood around to hope for a sound campfire. The Ghora Gaad gurgled not too far away. 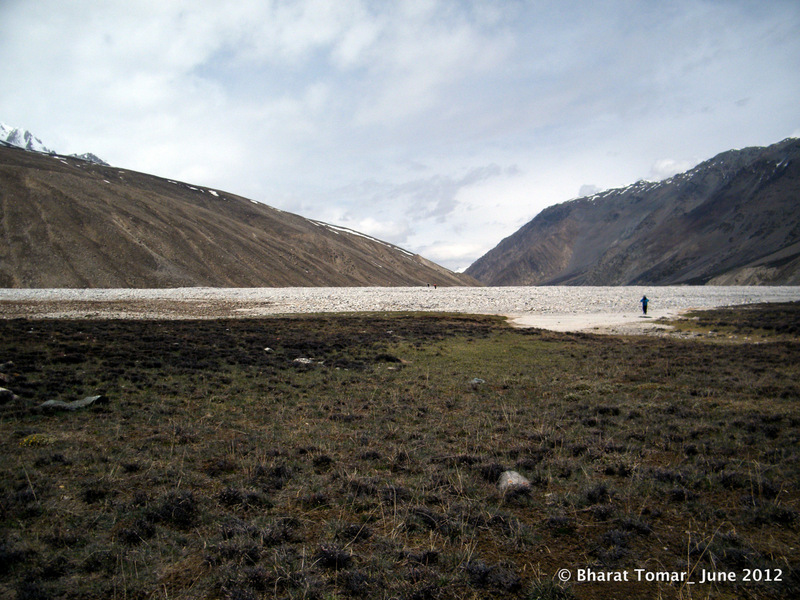 The tall walls of the Suraji Glacier were faintly visible above the shallow horizon to the East. We had covered good ground today! With 3 more days of good weather we would be much better placed to achieve mission objectives. We decided to call it a day.